Seoul and Washington said Friday they plan to complete the stationing of advanced U.S. missile defense assets in the South within next year, adding that this will help counter North Korea’s growing nuclear and missile threats. Despite Beijing’s stringent opposition, the allies reiterated that the plan would not undermine its “strategic deterrence,” pledging continued efforts to seek neighboring countries’ understanding. “With North Korea’s nuclear and missile threats escalating, given its recent test of a Musudan missile, we’ve been accelerating talks with the U.S. to announce a deployment decision at an early date so as to display our resolve to sternly respond and minimize unnecessary speculation and dispute surrounding the plan,” South Korea’s Deputy Defense Minister Yoo Jeh-seung told reporters. Seoul now faces the daunting task of convincing China and Russia of its decision to deploy THAAD as part of defense against its recalcitrant neighbor. The two nations have displayed resistance to the system’s presence on the peninsula as they see it as the South’s de facto joining of the U.S.-led global missile defense program directed at them. Shortly after the announcement, Beijing’s Foreign Ministry issued a statement, expressing “strong discontent and firm opposition,” and urging Seoul and Washington to call it off. It also summoned the two countries’ ambassadors to lodge a complaint. Russia’s Foreign Ministry also expressed “very serious concern” later in the day. “(The U.S.) continues to build the capacity of the Asia-Pacific segment of the global missile defense system, which tends to undermine the existing strategic balance in the Asia-Pacific region and beyond,” it said in a statement. In response, Cheong Wa Dae said the decision marks a “self-defensive step” to safeguard national security and public safety in the face of evolving North Korean threats. “To us, it is a matter of survival. If North Korea stages a provocation, the No. 1 victim would be our country and people,” a presidential official told reporters on customary condition of anonymity. Yoo said his government had provided advanced notices and explanations to China and Russia. “THAAD is a defense system whose utility is confined to North Korean threats, not a third-party nation, from the aspect of the right to self-defense,” the deputy defense minister added. At a joint news conference, U.S. 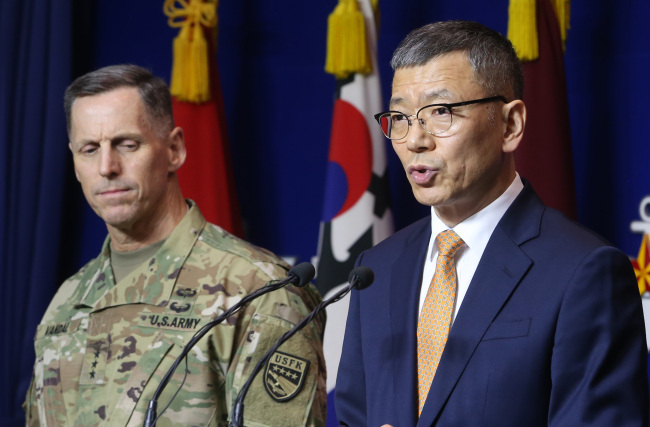 Forces Korea Chief of Staff and Eighth Army Commander Lt. Gen. Thomas Vandal said the decision is an “important milestone,” but there is still more work to do. He also vowed to meet environmental, health and safety standards for residents near the envisioned site. Since the allies launched formal discussions on a THAAD deployment last February, a joint working group has been carrying out feasibility assessments on multiple site options such as through simulation analysis and field inspection. The panel is expected to submit its final report to the two countries’ defense ministers after concluding remaining technical and administrative tasks, Yoo noted. The site selection has emerged as a political hot button due chiefly to potential health concerns over electromagnetic waves emitted by the X-Band active electronically scanned array radar, a core component of the THAAD battery. Currently the candidate locations are believed to have been narrowed down to a few. It is widely expected to be Chilgok County in North Gyeongsang Province where the Camp Carroll Army base is located, or Pyeongtaek in Gyeonggi Province, the new home of the USFK’s headquarters. Other options include Gunsan, North Jeolla Province; Wonju, Gangwon Province; and Eumseong, North Chungcheong Province. “The primary work of the JWG was to find a very important balance between operational effectiveness and the environmental, health and safety concerns of the public,” said Major Gen. Robert Hedelund, the commander of the U.S. Marine Corps Forces Korea. Chilgok appears to have high chances of housing the high-tech gear, given its relatively small population of around 130,000, the presence of U.S. strategic assets there and that it is outside the up to 200-kilometer range of 300-milimeter North Korean multiple launch rocket systems. But with an estimated range of 200 kilometers, THAAD would not be able to intercept missiles falling toward the Seoul Metropolitan Area if stationed at Chilgok, some experts argue. Pyeongtaek, in contrast, may be most suitable for defense of the capital, but remains within the range of North Korean main lines of resistance. It is also located nearer to China toward the western coast. “You can’t think that the alliance will deter and respond to North Korean threats with the intercept missile system alone,” Yoo said when asked to address potential concerns over a possible defense vacuum around the capital territory. Despite his promise to seek public understanding before unveiling their final choice, Yoo failed to provide a detailed plan to secure consent from the residents and at the same time prevent any information leak. After the announcement, residents groups in Chilgok, Pyeongtaek, Wonju and Eumseong released written protests or convened emergency meetings respectively to explore ways to convey their opposition and safety jitters. Some 3,000 people in Chilgok are set to stage a sit-in in front of the Waegwan Station. An association of 40 civic groups in Wonju said it will hold a related news conference on Monday, while a Eumseong committee which has been carrying out a signature-gathering drive vowed to deliver 10,000 autographs to the Defense Ministry as soon as possible. 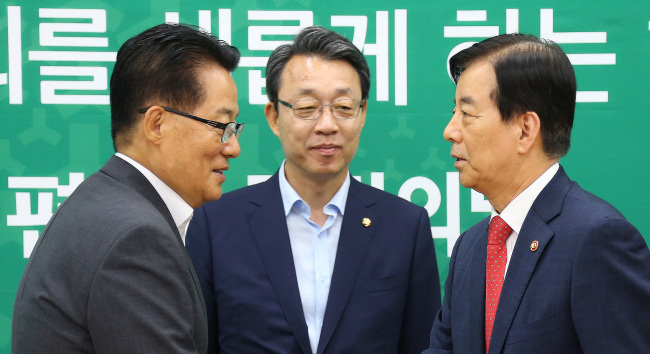 The decision also drew mixed responses from the political circles here as Defense Minister Han Min-koo informally visited the three major parties to brief on the decision. The minor opposition People’s Party said it opposes the deployment plan, calling it “impractical,” especially in terms of its military effectiveness and potential consequences on diplomatic and economic ties with Beijing. “The government should have taken deeper consideration of China’s opposition, which may have an impact on the people and our economy,” party spokesman Rep. Son Kum-ju said at a news conference at the National Assembly. The major opposition Minjoo Party of Korea displayed skepticism over THAAD’s military effectiveness and concerns over public safety and relations with China. It also took issue with the Defense Ministry’s failure to hold discussions with the people and the opposition camp.